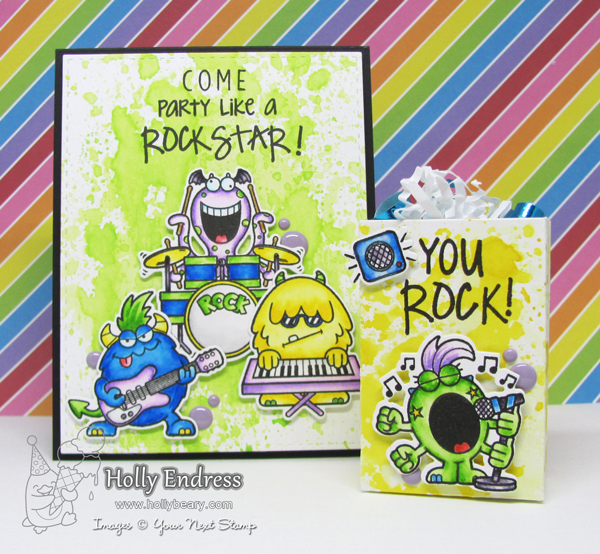 Hollybeary Creations : YNS Birthday Feature Week!! Happy Monday everyone.. It's time for our Feature Week at Your Next Stamp. This month we are continuing our Birthday Celebration with a week of "Birthday" Projects! All week long the Design Team will be showcasing lots of great projects for all those Birthday Celebrations! 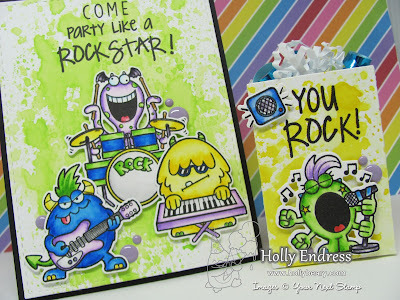 I created a fun Invitation and Thank You Gift Bag using the new Silly Monsters Rockstars set & Coordinating dies. I started out buy created a Distress ink background on some watercolor paper using Twisted Citron for the card and Mustard Seed for the Gift Bag. I'm loving this technique and look with Distress inks right now so much I may need someone to take the Distress Inks away..lol Then I added some drops of water and dabbed the panels with a paper towel picking up come of the color and created splotches. Then I die cut the card panel with the Largest Stitched Rectangle Die and I used the Scalloped Topped Treat Bag die for the Yellow panel. After I die cut the bag I trimmed off the Scalloped flat and stamped the You Rock sentiment in Black ink. Then I assembled the bag and set it aside. 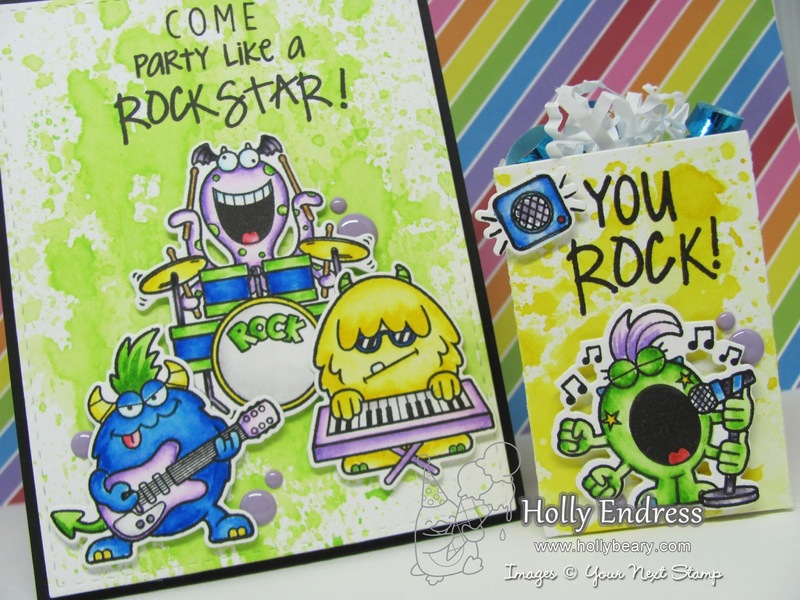 For the card panel I stamped the sentiment Party Like a Rockstar in Black ink and then using the new Mini Letters and Numbers Stamp set I was able to spell out Come and stamped that using the Mini Misti. Once I had the sentiment stamped I adhered the panel to a Black Top Folding card base. You can add a panel inside with all the party details. Or you could make this a Postcard and add them to the back. Then I stamped all the images onto some Bristol Paper using VersaFine Black ink and I colored them in Zig Clean Color Real Brush Markers. I added a little color around the inside of the images and then using a slightly damp paintbrush I moved the color around to fill in the images. Once the images were dry I die cut them using the coordinating dies and my Big Shot. I adhered them to the card and gift bag with some Foam Tape and added some Lavender Gumdrops for an extra pop of color. Head over to the Your Next Stamp Blog for more great Birthday Inspiration and be sure to join us each day this week for more projects. And leave a comment while you are there each day for a chance to Win a Stamp Set of your choice!